HYDERABAD, TELANGAANA, INDIA, July 4, 2018 /EINPresswire.com/ -- According to the latest industry report published by Market Data Forecast, the Global Advanced Wound Care market is estimated to be USD 9.04 Billion in 2018 and is predicted to grow at a steady annual growth rate of 4.48% to reach USD 11.025 Billion in 2023. Recent advancements in medicine explain that wounds can be healed quickly with dampness around it rather than drying. Implementing this explanation into practice, Advanced Wound Care management has sprouted lately. It was also confirmed that in order to achieve scar-free and quick healing, it is necessary to have some moisture around the wounds. Most of the products that are used in this wound care process are the hydrogels, hydrocolloids, foam and film dressings, collagen products, alginate dressings, gauze composites, and others. These products are widely used for burns, leg ulcers, pressure ulcers, surgical wounds, venous ulcers and diabetic ulcers. The devices used in this process may encompass electrical stimulation devices, negative pressure wound therapy device, hyperbaric oxygen tools and others. The most common problem in many developed nations is its geriatric population. The increasing age will cause several chronic problems in such people, and it is challenging for the governments to provide accurate medical care to them. Diabetes is one such problem that has become common in recent times. In the US alone, 25% percent of people over the age of 65 are suffering from diabetes. It is also evident that the amputation chances were 10 times higher for the people with diabetes than the normal. These two are the principal factors driving the global advanced wound care markets. Other important growth drivers include increasing disposable income, traditional wound care issues, increasing chronic diseases, expenses involved in hospital admissions, raising physical activities, rapid treatments, government initiatives, the introduction of technology in medicine, sophisticated clinical infrastructure, and so on. However, the lack of awareness in remote areas, expensive treatment costs, proper healthcare in rural centers, and reimbursement policies may act as inhibitors to market growth. 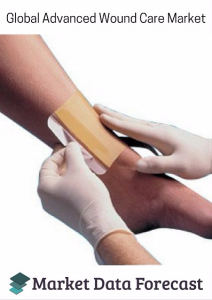 This report provides the useful insight into global advanced wound care market and its segregation based on type, applications, end-users, and geographical regions. The dressings segment which includes hydrogels, hydrocolloids and other moist dressings’ accounts for the largest market size and continues to lead with the prevalent ulcers. Active wound care is also growing at a rapid pace and will soon reach the dressings segment. The surgical wounds segment is projected to lead the global advanced wound care market owing to the increased cases of diabetics and respective foot ulcers. The skin ulcers segment is also moving swiftly among the international markets. A large number of hospitals and clinics around the world has made the Inpatient services segment to bag the highest share of the market revenue. However, with the raising interest for personal healthcare, outpatient services will soon outrun the former. North America with its continuous investments in technology and healthcare, increasing number of aged population and the prevalence of dreadful diseases leads the global advanced wound care market with more than 35% of the total market size. Europe stands next in line to North America with Spain being the top contributor to the global markets. The Asia Pacific with its increasing investments in healthcare and growing awareness among public will surely open many unexplored markets. •	Smith and Nephew Plc. •	ConvaTec Group and others. Acelity L.P. Inc is expected to dominate the world market for advanced wound care followed by many existing and yet to come organizations. Recent trends in the market like the announcement of Smith and Nephew about European introduction of MolecuLight i:X in December 2017, which predicts the level of harmful bacteria around wounds can provide some new inspiration to the global advanced wound care markets and thereby providing a significant number of future opportunities for the worldwide market expansion.